The trophy is an annual points trophy and will be awarded to the dog gaining the most points, providing they satisfy the qualifying criteria. Only members of the Northern Newfoundland Club are eligible to be considered for the trophy. Points will be counted annually between AGM's of the Northern Newfoundland Club. Once counted, the Records Keeper will contact the owners of the 5 dogs with the most accrued points for that year. Should they wish to be entered for the trophy they will need to reply to the Records Keeper in writing by the second Saturday in November in order to qualify. Points may be gained at any or all certified tests at Northern Newfoundland Club events. A minimum of 3 points must be gained from draught working tests. The winner of the trophy will be announced and presented at the Northern Newfoundland Club Christmas Dinner, should anyone be unable to attend the dinner a nominee can be appointed to accept the trophyon their behalf. 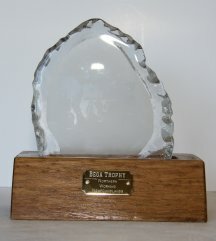 The rules and regulations for awarding the Bega Trophy are determined by the Northern Newfoundland Club Working Sub-Committee and may be amended at any time. Any such amendment will be published in the Northern Newfoundland Club news letter, NewfLetter and Website.